Here we are at the final week! I can't believe it has been six months of me wearing nothing but weave while growing my real hair underneath. 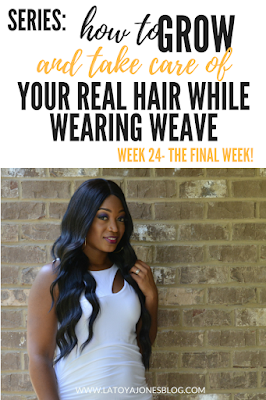 I must say that this week is bittersweet because I do miss my real hair so I'm happy that I'm getting a chance to wear my real hair. But I also am going to dearly miss wearing my wigs! I am not putting them away permanently, although I am going to wear my real hair for a few months and let it breath! This week I took all of my hair down, shampooed, and deep conditioned. I then straightened my hair bone straight. Although I did see growth, I also saw split ends that looked an absolute mess! Getting a trim was definitely at the top of my list of to-do things. Remember, although it has been six months since the last time I wore my real hair, it has been ONE YEAR since my last relaxer. Like many others that fall prey to wearing weave for long stretches, I may have missed a trim or two. Don't be like me! I recommend getting your trims every three months. Let's add up how much new growth I should have in six months. Normally hair grows on an average of half an inch per month. So in six months I should have three inches of new growth. If I skipped at least one trim, that means I need to cut at least a full inch of hair leaving me with only two inches. Many times we see that we have a lot of new growth but when we fail to get trims on schedule that means we have to get more cut. This is why a lot of times we don't think our hair is growing at all. The fact of the matter is that it is growing, but we are trimming off the length instead of retaining it. But do not let that deter you from getting trims. As long as you keep a schedule and don't skip any you will not have to get as much cut and you will retain more length. I definitely saw length after straightening my hair. It grew slightly below my shoulders! Yay! This proves that you definitely can grow your real hair while wearing weaves, wigs, braids, and other protective styles. You can modify this series as it fits you by extending it or shortening it. It's all about what you prefer!